Tilly boards a plane on the other side of the world. She’s determined to reach Roone, a small island off the west coast of Ireland, in time for Christmas Day. Tilly carries a troubling secret and Laura, a woman she’s never met, might be the only one who can help her. Except that Laura has no idea that Tilly exists. And with five children, a mother-in-law stranded on the island and a husband with whom she’s barely on speaking terms, an unexpected guest is the Christmas present she hasn’t been waiting for… A storm is heading for the island, but will peace be restored before the snow melts? 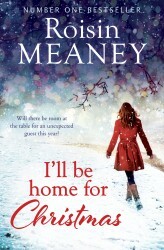 I’ll Be Home for Christmas is a feel-good tale of magic, sparkle and new beginnings from bestselling author Roisin Meaney.